New Look Bingo first started in April 2013, and it was given a revamp for 2015 with a completely new look, moving from white and blue colours to green and black. The site runs on the Cozy Games Software on the Live Bingo Network (LBN), and before you ask, it doesn’t have any affiliation with the clothing brand of the same name. 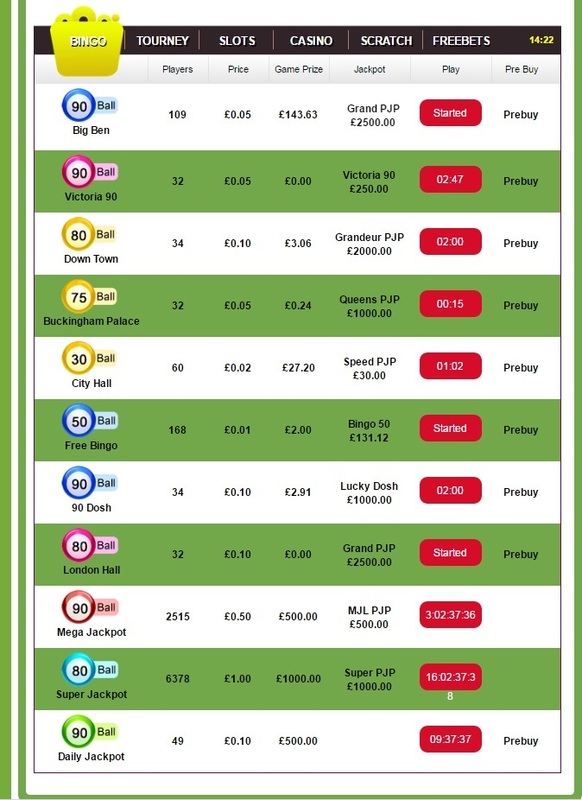 New Look Bingo offers 10 bingo rooms in total, and each of them is different to the last. The games made available include 90 ball, 80 ball and 75 ball. 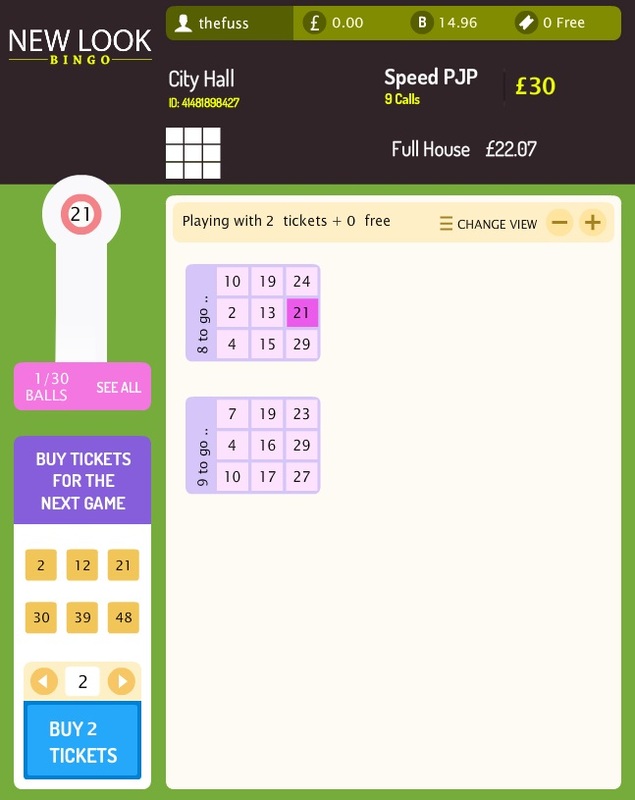 The ticket prices start at zero (through free bingo) and go up to 15p a card. New Look Bingo is powered by Cozy Games bingo software. Thanks to the mobile compatible HTML5 software you can use this site on your mobile, meaning you can use it on the go as well as in the house. They accept a number of different deposit methods, including Visa, MasterCard, Maestro Switch, Solo, Visa Electron, UKash, Paysafecard, clickandbuy, UseMyBank. New Look Bingo is partnered with Cozy Games Management Limited to bring bingo and online games to you, and the license is issued by the Gambling Supervision Commission of the Isle of Man. When playing on New Look Bingo there is a £15 free play no deposit bonus available, with this you can get a maximum of £30 of winnings that you’re able to withdraw. If you do choose to make a deposit on the site, you will be able to access all that each of the varied bingo rooms has to offer. Plus you’ll get a bonus for your first three deposits. You get 500% on your first deposit, 350% on your second deposit and then 300% on your third deposit. There is a minimum deposit of £5, so the first time you deposit any money on New Look Bingo you’ll have £25 to play with. That’s a huge offer for new players, and definitely, something to draw you to play on this site. You can also take advantage of the New Look Bingo Loyalty Scheme too, you can move up the ranks from Silver to Gold, to VIP and then onto Super VIP. This enables you to take advantage of the increasing reload bonuses. Not only that, but playing bingo is worth 1 loyalty point for every £1 spent, and you’ll get 1 point for every £10 spent when you’re playing on the slot games. 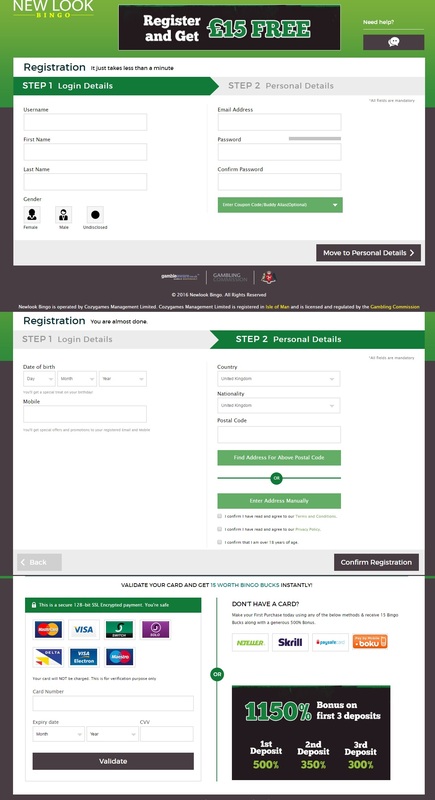 To register for the New Look Bingo is a very easy process, there are a number of boxes that need filling out with personal details, you’ll also need to create a username and password to let you login to the site when you return. Registration is complete when you put in card details, this helps to verify the account and prove that you’re a real person and not just a robot. Putting in these card details will not draw any money from your account, you can choose to do that later with a deposit, but you will receive your £15 welcome bonus. New Look Bingo offers a variety of different bingo games to play on their site, including 90-ball, 80-ball, 75-ball, 50-ball and 30-ball. The software is very clean and easy to use, like all Live Bingo Network sites. There are 8 different bingo rooms to play in, most of them are open to players who have deposited any money, but you won’t be able to play in some of them. Ticket prices start from as little as 1p. New Look Bingo also offers a daily jackpot which is priced at 10p a ticket and gives you the chance to win £500. There are also other jackpots on offer at the moment, a Mega Jackpot where you can win £500 and a Super Jackpot where you can win £1000. The games of bingo on the site are pretty much straightforward, the number of balls tells you how many will be in each game, on the right-hand side of the screen you’ll see the numbers that are being drawn, it will also give the number of balls that have been drawn so bar. As you play the games there’s also a chance to interact with the other users of New Look Bingo, with everyone typically sharing the amount of numbers left to get, for those with three numbers left to get, they’ll write 3TG – which means three to go. Another plus to using this bingo site, when you have those really annoying games with only one number left to go, sometimes you’ll find you’ll win a fraction of the winnings too – which is just a slight reprive. The page to make deposits and withdrawals are pretty straightforward, and there are a number of different options for you to pay with, which make it easy. You can deposit between £5 and £500 per transaction. When it comes to withdrawals, you need to have a minimum of £30 to withdraw, and it’s capped at £300 per week. These withdrawals are usually processed within three working days. It’s also important to know that if you win a bingo or progressive jackpot, it won’t all be paid at one, but in £1,000 weekly instalments. New Look Bingo not only offer you plenty of bingo games to play on their site, there’s also a wide variety of other games on offer under the Slots tab on the site. 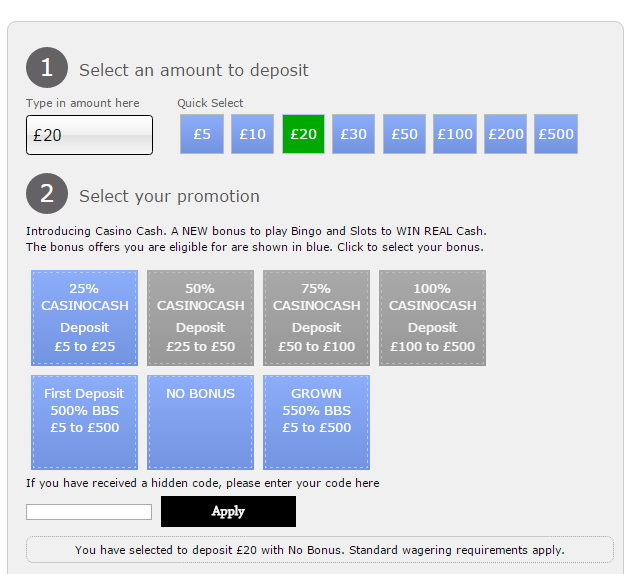 You can play slot games, casino and scratch card games on the site. Under the Slots tab, there are 41 games to choose from, all of which have different themes, with Christmas, Easter, and Valentine’s all featuring, there’s also Coffee House which looks extremely like the coffee house from Friends. There are 10 casino games to pick from, and 13 scratch card games to try your luck at. There’s also a new tab, Tourny, which is going to be Tournament games, but we’re still waiting for that to be updated with new games to play. You’ll also find eight FreeBet games to play, ideal if you’re new to these sites and don’t want to bet real money at first. If you need to get in touch with New Look Bingo via email, just use the address: support@newlookbingo.com They aim to reply at the earliest possible moment. If you would rather speak to a representative directly, use the number: +44 (0)2036 081305 This number is available 24/7. If you are logged into the site, you can raise a ticket. With this, they aim to respond within 10 minutes. You can also speak to someone live on the site in real time to ensure you get any queries answered sufficiently and efficiently.